The opening of the new Sticks ’n’ Sushi’s Chelsea Restaurant marks their 8th in the UK. Its kitchen sits at the mid-point between Tokyo and Copenhagen offering freshly made sushi and grilled yakitori. Sticks, sushi and sashimi can be ordered a la carte as individual pieces, or as menus composed by Sticks’n’Sushi. Martin’s Properties met Group COO Andreas Karlsson to discuss life in Chelsea. On being asked about his long-held dream to open on the Kings Road Karlsson comments: “We fell in love with the Kings Road on one of our first reference trips to London, there is a Japanese saying: ‘Work extremely fast with a great deal of patience’ – our Kings Road restaurant is the epitome of this saying.” Conversations started over three years ago to secure their largest restaurant yet. The success of Sticks’n’Sushi lies in its Danish Dare and Japanese Discipline. This is evident more than anywhere in the Kings Road’s kitchen, which Karlsson describes as a battleship. The ‘battleship’ occupies a vast amount of the ground floor and creates a stage where chefs perform every detail of preparation and presentation. Karlsson comments: “There is no hiding place, which takes an enormous amount of discipline with every corner on view. The whole team are treated as a cast to ensure guests enjoy their experience and most importantly return”. 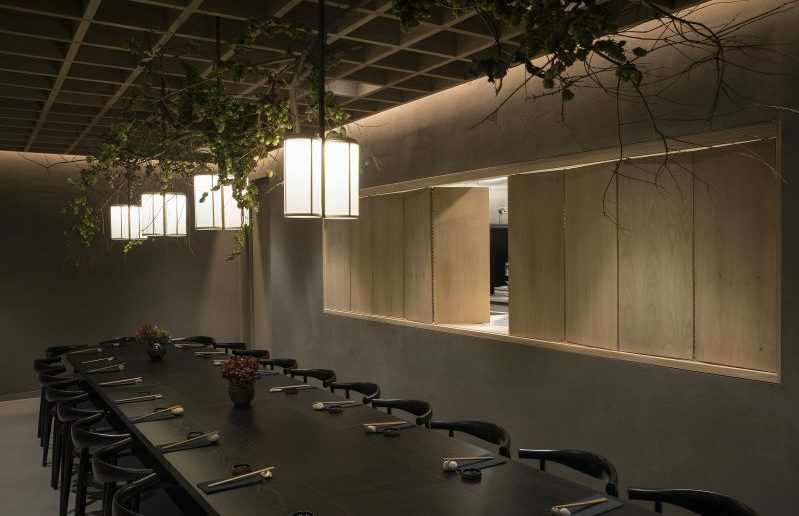 Working with Danish architects NORM Architects, the Kings Road restaurant celebrates their Japanese and Danish roots. The ground floor’s dark hues create a dark cosy Japanese atmosphere full of finely crafted details. Walking up to the first floor it gets brighter and there is noticeable Scandinavian elegance in the light first floor dining room. The basement is home to The Kings Room, an intimate 24 seater private dining room; a hideaway from the bustle of the main restaurant. The dark cosy interiors, softened with a garland of British hops hovering over the table, are served by their own bar and kitchen with the option of being on view for theatre or closed for complete privacy. An important factor in the restaurant’s design is how it operates. The chefs take as much care in the presentation of their food as in the preparing. To ensure each dish arrives with its diner as it leaves, plates are carried upstairs, this also maintains the food’s temperature. Karlsson notes ‘this is also great exercise for staff’. The Chelsea restaurant has already become part of the neighbourhood. General Manager Catherine McDermott has charmed a host of regulars, from families who return every Sunday to local diners. Whilst the regulars are drawn to the high quality food, the bespoke cocktails from the Chelsea Cocktail list have also proved popular – last week alone they made 104 Purple Rain’s (butterfly infused Roku gin with Japanese yuzu tonic).